Empress Wu has a problem: she's trying to build a massive buddha statue for her coronation and important people connected to it keep bursting into flame. And it's not any normal flame either, but one that comes from within, and is triggered by sunlight. She suspects the Prince, or another rival, because some people don't like the idea of a woman ruling China. Or maybe it's because she keeps killing dissidents? Or maybe it's both. Unclear. Regardless, she's got a problem. Thankfully, the Chaplain (a sort of magical mystery monk) appears as a talking deer and tells her to hire her old enemy Detective Dee, who is in jail because he opposed her rule (either because she's a woman or because she keeps killing dissidents, or both). Despite this idea being pretty illogical, she decides to go ahead and do it. Only, when she sends her right-hand woman, Jing'er, to let Dee out of prison, she finds a crew of assassins already there, and hellbent on assassinating someone (though who, exactly, is not clear). Despite his reservations about the Empress, Dee agrees to head the investigation. Weirdness ensues. If a heavy dose of kung fu action peppered with steampunk and salted with a pinch of Tim Burton sounds like your thing, then you should check out DETECTIVE DEE AND THE MYSTERY OF THE PHANTOM FLAME. If not, then fairly warned be thee, because that's exactly what this film is. Unfortunately, all this comes at a price, and that price is the mystery narrative all this is built around. It's confusing at times, and downright illogical at others. I won't spoil things for you, but suffice to say that when plot twists are revealed, they often render earlier actions unfathomable and purposeless. As many "woah!" moments as the film provides, there are just as many, if not more, points where you just look at the screen and say "huh?" Then the film ends in a sort of "well, we had to do it like this, because it's expected of us" way that will make sense if you've watched a lot of medieval kung fu period pieces, but feels unsatisfying when it could have gone a lot of different ways. 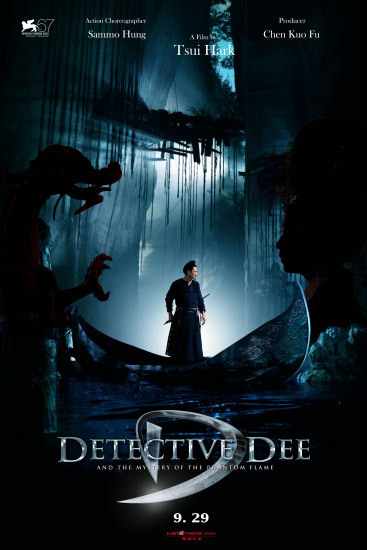 This kept DETECTIVE DEE from achieving greatness in my eyes, but I still felt like it was a lot of fun, and worth watching.